U.S. President Donald Trump could be a key factor in next week’s South Korean presidential election on May 9. Trump has alienated many in South Korea with his recent demand that the Seoul government pay $1 billion for the U.S. Terminal High Altitude Defense (THAAD) anti-missile defense system being deployed on the Korean Peninsula, his criticism of the U.S.-South Korea free trade agreement, and even his praise for North Korean leader Kim Jong Un, as well as for expressing a willingness to meet Kim without first consulting his key military allies in Asia. FILE - U.S. 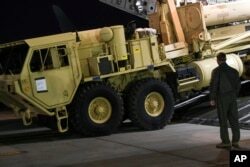 Forces Korea, a truck carrying parts of U.S. missile launchers and other equipment needed to set up the Terminal High Altitude Area Defense (THAAD) missile defense system arrive at Osan air base in Pyeongtaek, South Korea. Trump’s controversial criticisms of South Korea seem to be helping the presidential candidate most opposed to the U.S. hard-line policy on North Korea. Moon Jae-in’s supporters were literally dancing in the street at a campaign event in Seoul. The liberal Democratic Party of Korea candidate surged to 41 percent approval rating in the Dailian Internet news site survey taken on Tuesday, the last day polls are allowed prior to the election. Moon now has a 20-percentage point lead over his closest rivals. The human rights lawyer supports the U.S. alliance. But he argues that U.S. policies emphasizing military pressure and sanctions alone will not resolve the North Korean nuclear threat. 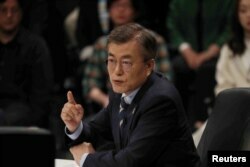 FILE - Moon Jae-in, the presidential candidate of the Democratic Party of Korea, speaks during a televised debate in Goyang, South Korea, April 25, 2017. Moon wants to ease tensions through dialogue and engagement and has said he would consider reopening the jointly run Kaesong Industrial Complex in North Korea, which was closed following Pyongyang’s fourth nuclear test in 2016. He also called for delaying the THAAD anti-missile battery currently being deployed in the southeastern region of the country, until the next president takes office. Moon’s reluctance on this issue had run counter to increasing South Korean support for THAAD in the face of continued North Korean ballistic missile tests. But his supporters credit him for standing up for local opponents concerned about possible public health effects from the weapon system’s powerful radar, and for wanting first to study the security benefits of THAAD, versus the risk of further provoking North Korea and alienating China, which has reportedly retaliated by limiting tourism and some imports. “Our party thinks (THAAD) must be renegotiated to adjust any cost sharing expenses, as it was done by the previous government,” said Song Jung-Bin, a Moon supporter with the Democratic Party Of Korea. After President Trump’s $1 billion THAAD demand, Moon’s lead in the polls increased. 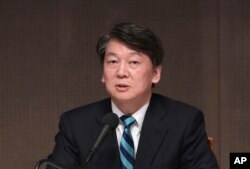 Liberal rival Ahn Cheol-soo, the People’s Party candidate, supported more pro-U.S. positions on THAAD and boosting defense spending, while at the same time also advocating dialogue and intense diplomacy to peacefully resolve the longstanding division at the heart of this crisis. FILE - Ahn Cheol-soo, a presidential candidate of South Korea's People's Party, speaks at a forum in Seoul, South Korea, Thursday, April 6, 2017. But Ahn’s rating in the last poll fell to only 19 percent. Even though he sharply opposed Trump's $1 billion demand, some critics say his vague move to the center was not enough to attract enough either conservatives or liberals. The conservatives, lead by Liberty Korea Party candidate Hong Joon-pyo, have struggled to regain public trust in the wake of the impeachment of ex-President Park Guen-hye over an alleged corruption scandal, that precipitated this early presidential election. 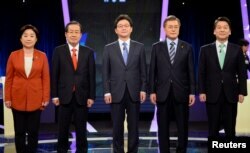 FILE - (L-R) Sim Sang-jung, candidate of the leftist Justice Party, Hong Joon-pyo, candidate of the conservative Liberty Korea Party, Yoo Seung-min, candidate of the conservative Bareun Party, Moon Jae-in, candidate of the liberal Democratic Party of Korea. Hong’s supporters say their candidate’s hardline support for THAAD, and for deploying tactical nuclear weapons in South Korea, will win support from a pro-national security silent majority overlooked by the liberal media. “Currently in South Korea [many people] are hiding their thoughts and votes,” said Lee Sung-Kook, a Yangcheon-gu district committee member of Liberty Korea Party. But Trump’s comments, not just on THAAD, but also calling North Korean leader Kim Jong Un a “smart cookie” for brutally consolidating power, has depressed support for the United States among some far right conservatives occupying a protest camp in front of Seoul’s city hall. “I am heartbroken over the U.S. because of [Trump's] recent comments,” said Hwang Eung-Joo with the Patriotic Camp that was originally set up to protest Park’s impeachment. Anxiety over Trump may further depress the conservative vote while energizing liberals that want the next South Korean president to stand up to American pressure.